As the Radio Four pips sounded for 9am, my husband appeared with uncharacteristic speed. His eyes were unflinchingly trained on the cooker clock. My old cooker does sterling service, but state-of-the art it’s not. It was once star-wars-white, probably originating somewhere early in the nineties. It has a big oven, little oven and grill and its fan wheezes breathily when it whirs into life. Its clock is one of those green digital displays which belong firmly in the last century. Does this denote unrivalled male victory the whole world over? Because it does here, and it did in my kitchen today. Apparently he had set our oven timepiece to coincide with the BBC time signal. To the second. I kid you not. His victorious exclamation arrived when, on the last long beep, the little green numbers also clicked over to the next hour. Somebody needs to go back to work. But not today. Because today was a bank holiday, and my husband was planning his campaign as Chef Extraordinaire. It was a little chilly. The garden thermometer read 13 degrees. But it was not raining, and in Britain, if the sun is out, even intermittently, it’s a possible barbeque scenario. As soon as we spot faint strips of sunlight seeping weakly through the blinds, we’re on the phone inviting the world and his wife around to shiver along with the family, sixteen sausages and about the same number of quarter pounders. So: eleven for dinner then. At eleven thirty, the first contingent arrived: my sister and her husband, with her brood of three. Phil was already settled in front of the other cooker in the household. The chimenea. Oh, yes, we have them here all right, with their seductive overtones of hot Mexican red earth and promises of eternal alfresco living. They rust contentedly in the corner of millions of British gardens, waiting for the day the sun shines. And Phil, my beloved pyromaniac, adores his. It is used at least weekly, to burn household bills for security purposes. At Christmas, just before the worst snow in decades, he threw a Christmas chimenea party. He bought gorgeous lanterns for the trees, transforming our back garden into a dimly lit post-Dickensian fairyland. Needless to say all the grown-ups stayed inside with the punch and the mince pies, while Phil could be seen glassy eyed, staring into the flames as men have for millennia, but with slightly less productivity. His hunched figure was accompanied by several small children, ours and everyone else’s. They were lined up on kiddie chairs on either side of him, with identical expressions, staring into the chimenea. Today, my brother-in-law affably accepted a cup of tea on entry, and gazed nonchalantly through the kitchen window. Only to spot Phil valiantly battling flames which were making their bid to exit the chimenea and go walkabout. Down boy, down. He doesn’t use charcoal, because that would cost money. He collects wood from the forest floor in large orange Sainsbury bags. As he puts it, Free Heat. Now I was brought up by an ex-scout who knows how to lay a good fire. Consequently I, too can build something which will creditably heat a can of beans in a bivouac. I know my woods. The ones that burn quick and fine to start up: the ones that will burn long and slow to ensure long lived heat. I imparted this information to Phil. But he was in no mood for slow and steady. Phil was in the thrall of that scarlet woman of the woodland world, the pine, who plays fast and loose, and whose flames are over all too quickly. Today, he had come back with a whole bag full of pine, and by 11:55am it was doing a passable impression of a dragon’s throat on a wrong-side-of-the-bed kind of day. Of course, half way through the exercise, with ravenous children chewing tables inside, the pine burnt itself out, puff, just like that, all gone, dragon out of gas. My brother-in-law was sent on a quick, top secret scouting mission to find more, because if my Mother had found out the children’s lunch was at stake, there would have been hell to pay. To his credit, by 12:45, the family was munching contentedly inside, while Phil resumed his customary glassy stare. Incommunicado. Communing with the flames. The dog loitered with intent. The over-burnt sausages had not escaped his notice. He hoped Phil might proffer them. But we finally managed to tempt the Chef inside, and the dog took matters into his own jaws. He was spotted moments later, attempting to bury the charcoal-black remains of three extinct sausages in a hole in one of the flower beds. If someone had seen the kitchen-diner at this point it is possible they might have alerted social services. Not an inch of surface was free. Something was parked everywhere. My sister offered to make a cup of tea, and we turned away from the table to face the Armageddon behind us. Not a word was spoken. We both knew if she went in, she might be some time. But the family is not one to leave a girl struggling by herself. Everyone pitched in after I had taken a photo, wafting children out of the way and whistling while we worked. And all was soon orderly again. We sat, replete with burgers and sausages, drinking tea. One by one, everyone drifted away. Rest time reigned. The third floor Child Exile Policy rendered it moderately peaceful. But as I settled down with my book the dog entered, whining. One of his hoarded sausages was firmly lodged in his mouth, and he couldn’t get it out. He is man… He make fire!!!!!!!! Him work with meat, wood and iron. Lydia, can you hazard a guess as to Dig’s origin? Serves mac right for burying them! Yeees…not thrilled about having to dispo them though….still he still has two for a rainy day. I must remember not too read your posts while I have my morning coffee … spurted all over my screen. Good one Kate. An accurate reflection of yesterday’s great day. Thanks. It’s funny how we are so used to family that we miss what your keen eye has seen! Everyone should have a Phil. For barbecue days only, of course. He seems more a burnt-food hazard than a fire one. I’m so glad you all pitched in to help your sister. Thanks Liz…..as I’ve commented many times before, life is never dull, is it…..
Oh, would that we could simply jump on the first plane there, Naomi! That talk the other day of swimming pools in the afternoon made the drizzle outside seem doubly treacherous! A barbecue is one way of doing less cooking though! 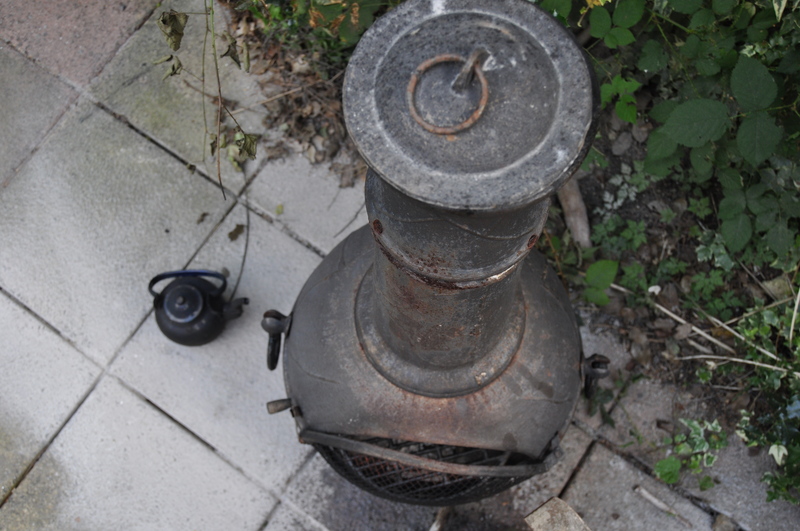 We have a chiminea just like yours, I like the photo from above, although I don’t know how you took it.